First, thank you to everyone who commented on Monday’s post. I want to reiterate that while dealing with the “homecoming” of a sick child is where I’m coming from… it’s applicable to so many situations when you’re faced with something difficult or tragic, then having to return to a new, much more difficult normal. In my quest to find non-medicated sanity, I decided my first step needed to find the easy stuff to take off my “stresses” list. The stuff that just isn’t as important as everything else so go at the bottom of my internal priority list, so I haven’t dealt with it yet, but they are stress points that, together, can add up. They are also things I’ve been dragging my feet on because I just don’t want to do, but know I need to do. Now, I was still getting a paycheck back then. So I’m not quite so free with using money to cure my stresses. However, one of my current areas of frustration that I’d put on the bottom of my list was my vacuum. It broke about a month ago. It’s probably something stupid like a belt, but I know NOTHING about vacuums, my hubby didn’t have time to fix it, and meanwhile, my immune-suppressed baby is crawling around and dropping her binky on dirty floors. Ugh! To add to it, I’d been frustrated before that anyway because we had a pretty cheapish one, and I could see that it wasn’t picking up all the dirt/dog hairs. I hated knowing Annabelle was putting toys in her mouth that had rested on that nasty floor. So, at my hubby’s encouragement, I broke down and bought a NICE vacuum. I’m still hyperventilating over the cost. But my carpet is cleaner than it has been since it was installed. ANd I breathe easier knowing my daughter isn’t eating dirt constantly. A trip to the store and a bit of (albeit guilt-ridden) money eliminated two stresses. It was like a stress-release sale! SOLD. This was not “easy” stuff. It was the least time-consuming and actually saves us quite a bit of money, but it was super hard. We’ve had our dog, Emma, for going on five years. She’s half Beagle/half ??. She’s never been the most easy dog for our family. She took delight in digging out of our fence in the backyard, darted outside every time we opened the front door, and had the most pitiful bark (actually, more of a painful howl) you have ever heard. Since bringing Annabelle home, it’s been doubling hard to deal with our sweet dog. I won’t go into all the details… but the final straw was a month ago when she brought a baby bunny into our living room and was chewing it right there on the carpet. Right where Annabelle plays. We spent the last month looking for a new home for her, trying to find either someone who would take her or a no-kill animal shelter she could go to. No luck. So last week, after coming to my complete end of my rope and about having a nervous breakdown (literally…), we made the super super hard decision to take her to the animal shelter. My hubby and I both cried. My kids cried (especially my eldest.) But in the end, we couldn’t afford her. We weren’t giving her the time she deserves. And I wasn’t able to mentally handle taking care of her on top of everything that goes along with caring for Annabelle. And it was just time to say goodbye. Please don’t think I’m a horrible person for doing this. I love dogs, I really do. But my family comes first, Annabelle’s health comes first. It was a stress that I just couldn’t handle anymore. I could give you a decent sized list of other little things I’ve done just to “get them out of the way” or get rid of a stress. Our garage sale a few weeks ago was one of them. I just wanted the junk GONE! And I’ve found much more since then… will be going to my sister’s garage sale this Saturday! But I won’t bore you with my whole list. The point is: If you find yourself overwhelmed… take a step back. Pick the quickest things you can mark off your list or eliminate that will give you the most “relief” for your buck, so to speak. Take a day, set everything else aside and just knock-em out. It’ll shorten your list, and maybe, just maybe, give you a little breathing room. Discussion: Anyone have some examples of things YOU’VE eliminated for the sake of sanity?? Simplifying Me is going to be a series for a while, posted on Mondays. Not sure how long, but I’m a work in progress, and sharing with you helps keep ME accountable too. And I pray that God might use something he’s pounding into MY head to make help someone else too. Guess that’s the whole reason I blog anyway! Wednesday’s will usually be reserved for fun posts/Annabelle updates. I know just what you mean. I am the same way. Only I keep lists. Actual lists. And cross off the items as I do them. It feels so good to be able to finally cross off something that has been on the list forever. And I agree that sometimes the little things add up into big things. Dealing with little things can be a relief to your soul. And try not to beat yourself up about the dog. You are right — your family comes first. I can imagine how you feel, but you have to make decisions that benefit your family. Keep up the good work, and hang in there! Actually, I'm a list person too!!! But… the last time I made a list, it was like 2 pages long and counting and about gave me a panic attack looking at it. I'll make a list again… when I get more of the "easy" stuff done so my list isn't quite so monstrous, therefore the list will be HELPFUL and not overwhelming. Maybe I just need to make an "easy stuff" list… forget the big huge things that linger out there, but just of the "check it off the list" kinda things that I can do quickly and be done with them. Hang in there, my friend. This is awesome progress, although I KNOW how hard giving up the dog was. I went through the de-stressing process during my divorce (dog one, a car, etc), then again when I freelanced for five years (amazing how much time I found for stuff when I turned off cable). This will lighten YOU as well as your life. *sigh* It was hard… hardest though to see my eldest so heartbroken. She's doing better though… already researching dogs that she wants to get when Annabelle is older and we can have one again! Oh… we so do not have cable. Well, we have cable internet, and it makes the few channels we have not come in fuzzy on the TV, but that's it, ha! And really, just the few changes we made have helped a little already. Hoping to keep the momentum going! OH! ANOTHER little thing I JUST did! I walked into the kitchen and noticed, hanging beside the cabinets… was a calendar. And a clock. WHich hasn't worked in I don't know how long. Unneeded clock (what microwaves are for) and 2 year ago calendar are now GONE! Krissy! I love your whole idea of "simplifying me". I have been thinking a lot lately of how quickly life can get out of hand and overwhelming (and I don't have 1/2 the crap you have). Sometimes I think about Mom and all her work stuff….Jami and her balance of work/family/school…man. Life can get hectic really darn quick! I can feel a tug at my heart to not let my life slip away from me and get out of control. I've been thinking a lot lately about lists and priorities and values…your "simplifying me" blog posts are amazing encouregment! I love you Krista! You are bogged down with a million and one things and yet God still is able to use you to reach out to other people! You are my baby sister hero! (ps: I'll still beat you up….mwahahaha!) Love you tons!! I love the idea for this series. This is something God's working on in my own life. I've been reading Simple Wisdom, sent to me by an online friend and the Lord has been using that book to speak to me about this. And then your blog this morning. I'm going through the same kind of season you are, KP. My house looks like a hoarder lives here. When Wade and I got married, we just sort of dumped two households together, then came Jackson/Parker/Simon BOOMBOOMBOOM, and with them, 27 months of Hyperemesis Gravidarum (and you KNOW how productive that makes me) and new baby-ness. Now that Simon is almost two, and I know he's my last one, (sniff sniff) I HAVE TO HAVE TO HAVE TO find some peace and sanity around here. Oh, and by the way, we made an offer on a house and just found out about three hours ago that it was accepted, so now I'm going to be moving on top of all of this other stuff. I graduate May 12, so I'm just trying to get through the mountain of schoolwork I have until then and not even think about the move. (It's only six or eight miles away, but it's more land and a bigger house for an AMAZING price.) AAAAAAHHHHH!!!! Can you tell I'm stressed? So anyway, I have to get this house cleaned out and get rid of everything that we don't absolutely LOVE and can use RIGHT NOW, not sometime in the future. You're a wonderful person, a spectacular mother, and I love you bunches! YEAH for a new house!!!!!! SO SO SO excited for you, my friend! We thought/tried to make Emma an outside dog. Yeah, it didn't work. 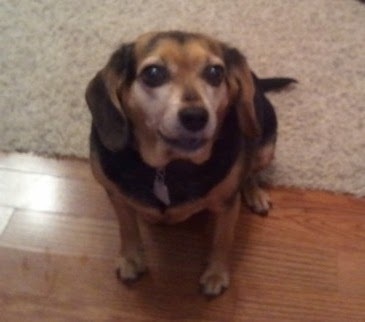 She would howl ALL the time and when in a neighborhood… that just wasn't okay! I had constant fears that the neighbors thought we were beating her or something, because it sounded like she was being hurt! Oh Krista, I love, love, love this because I can just sense the stress rolling off of you through this post. You know about the decision I made recently to simplify my life. Not always easy but necessary. Thank you for this post, Krista. It resinates with me, as I am also trying to eliminate a few stresses in my life. I'm in the middle of a not-so-kind-to Mommy-but-so-far-healthy-baby pregnancy and I do not want to risk anything on losing this one! (Plus I have a seven year old son with ADHD and autism, which is fun in and of itself!) It has felt that people were not understanding of this and trying to pull me in all sorts of different ways. In fact, today, I finally said enough was enough with the religious education classes and told my director that I cannot do this anymore. What a relief this brought to me. There are other things I am slowly cutting out as well, but baby steps, baby steps. It's so disappointing to see yet another person think that animals are disposable. I'm done here. Have a good life. For the record, I don't believe they are disposable. If it would have come down to "I don't have time to take care of a dog" I couldn't have let her go for just that. My family is heart-broken over it. For the health of my daughter, which is the point which we were at, yeah, my daughter's life DID have to take priority over our dog, as much as it hurt my heart to do it. If she'd been the easiest dog in the world to take care of, and she'd still been bringing dead animals that could carry deadly germs into our house, we still would have had to make this tough decision. I'm sorry this is a disappointment for you, and it makes you think less of me. Unfortunately, I had to make the decision that was right for my family, regardless of those who might end up thinking less of me as a person. Yo Vicky. Wow. My baby sister has about a million things going on and you think it wise to post your selfish little comment. People who value animals over humans never cease to amaze me. This was a REALLY hard decision for this precious family. Your lack of HUMAN compassion is saddening. I too am disappointed in you as well….humans always take precedent over animals. We all have a choice to make when it comes to our 4-legged friends and when our 4-legged friends create a dangerous environment for our children, we have to make tough decisions. Choosing to put an animal over the life of her child, would be a poor decision. If you can't recognize that, then you need to spend more time with humans. We too had to make a tough decision regarding a rescue dog several years ago. The dog, Ginger, was beautiful and well behaved for me. But when I wasn't home she would attack my children. She bit my daughter over her eye one day. My husband was home with the children and the dog. We took her back to the shelter that we got her from. While there, the folks at the shelter had the same attitude towards me as you do towards Krista….that is, until the dog tried to bite her as well. Then she realized that it wasn't because we wouldn't or couldn't take care of the dog. We now have a rescue dog that has been with our family for 7 years. We love her, she is the perfect dog for our family. Ginger however wasn't. Krista made the right decision. I love to read this blog. Yay for simplifying your life! You need that! And I so understand your decision to take your lovely dog to a shelter. I know how much work a dog can be … and especially when you have to deal with a child who needs lots of care you just don't have that time. I'm so sorry that you had to give up your dog, but you made the right decision. As much as you loved the dog, the dog is not more important than your child. With the change in the weather and all the creatures out and about again, you were out of time. We'll pray the dog gets adopted by the right family.